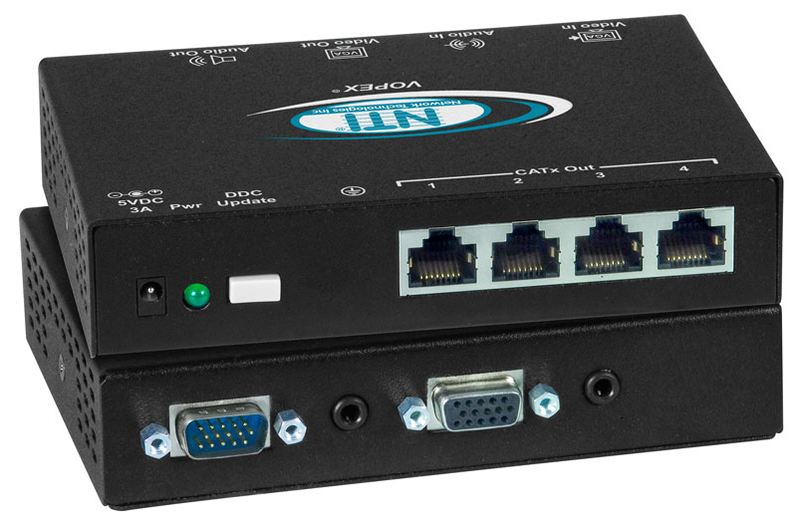 The VOPEX®VGA Video Splitter/Extender simultaneously broadcasts high-resolution VGA video from one computer to 4 or 8 remote monitors located up to 1,000 feet away using CAT5/5e/6 cable. Audio can be broadcasted to self-powered stereo speakers at the local unit and each remote location when using NTI's remote units with audio option. The VOPEX® VGA Video Splitter/Extender simultaneously broadcasts high-resolution VGA video from one computer to 4 or 8 remote monitors located up to 1,000 feet (305 meters) away using CAT5/5e/6 cable. Audio can be broadcasted to self-powered stereo speakers at the local unit and each remote location when using NTI's remote units with audio option. The VOPEX VGA Video splitter/extender system has two components: the VOPEX-C5V(A)-xC1000 VGA broadcast unit, which connects to the host computer and also supplies video to a local monitor, and an XTENDEX® remote unit (ST-C5V(2A)-R-1000SP or ST-C5V(A)-R-600) for each remote monitor. The units are interconnected by CAT5/5e/6 cable. Broadcast real-time VGA video and stereo audio to multiple locations. Supports resolutions up to 2048x1536 using NTI's 1,000' (305 m) remote units and 1920x1440 using NTI's 600' (183 m) remote units. Easily expandable. Add remote units as you add monitors. A pure hardware solution-no software conflicts. High quality rugged steel construction with durable powder coat finish. Ideal for digital signage, movie theater lobbies, point of purchase displays, conference centers, airports, and other applications that require multiple displays. Supports a PC, SUN or MAC with VGA video. DDC Update button for sending updated EDID to the graphics card in the CPU. Horizontal: 15 kHz to 130 kHz. Supports Separate and Composite TTL level sync and Sync on Green. Maximum input levels: 1.45 p-p. Female RJ45 connectors for CAT5/5e/6 cable to remote units. Female 15-pin HD connector for local monitor. Crisp and clear 2048x1536 video resolution. Frequency response: 20 Hz to 20 kHz, ±1 dB. Signal-to-Noise Ratio (SNR): 76 dBA. Line level output; supports multimedia speakers. Maximum I/O levels for audio: 3.1 Vp-p (line level). Use CAT5, CAT5e or CAT6 UTP straight through cable for TIA/EIA-568B wiring terminated with standard RJ45 connectors (not included). Operating and storage relative humidity: 17 to 90% non-condensing RH. Refer to the resolution charts below for resolutions at different lengths. Maximum output level for video: 1.45Vp-p.
ST-C5V(2A)-R-1000SP: Automatically adjusts the video quality and color skew to compensate for varying lengths of CATx cable. ST-C5V(A)-R-600: Video quality adjustment for different lengths of CATx cable is done manually for the video-only remote, and automatically for audio/video remote. Note: the extra 3.5mm port on ST-C5V2A-R-1000SP for microphone is not supported by the VOPEX-C5VA-xC1000. Frequency response: 20 Hz to 20 kHz, ±1dB. Total Harmonic Distortion and Noise (THD+N): 0.017%. Maximum output levels: 3.1Vp-p (line level).